Ingredients: SIMMONDSIA CHINENSIS (JOJOBA) OIL, COMMIPHORA MYRRHA (MYRRH) OIL. I have been using these oils for a couple of months now and am very happy with them. The customer service at Well.ca far exceeds any I've dealt with before. They are amazing and so helpful and have gone over and beyond getting information and answering questions for me. Excellent service and great products! Disappointing. Hardly has any aroma of the myrrh at all. I like this diluted myrrh. The essential oil is from France so it's deep and not so mushroom-y as myrrh of other origins. I used it once on minor cuts on my hand overnight and it sped up healing significantly. 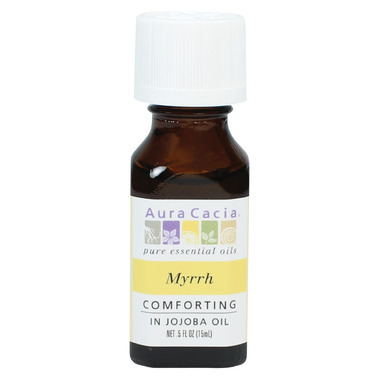 The diluted myrrh oil is also good if you do not plan to use it on a daily basis as pure myrrh essential oil tends to solidify.